UPDATE: Well I shall revisit the main crest. Consider this design the Beta. I am still plugging away on the jersey designs for the upcoming Game Of Thrones offer, which will feature the Night’s Watch, Targaryen Dragons, and Stark Direwolves. Both Targaryen 2.0 and Direwolves 4.0 need some touching up, but I thought I’d share the Night’s Watch design. If you’re not familiar with the books or show, the Night’s Watch do not have a sigil. So I created one that uses a crow – a nickname for the Watch. 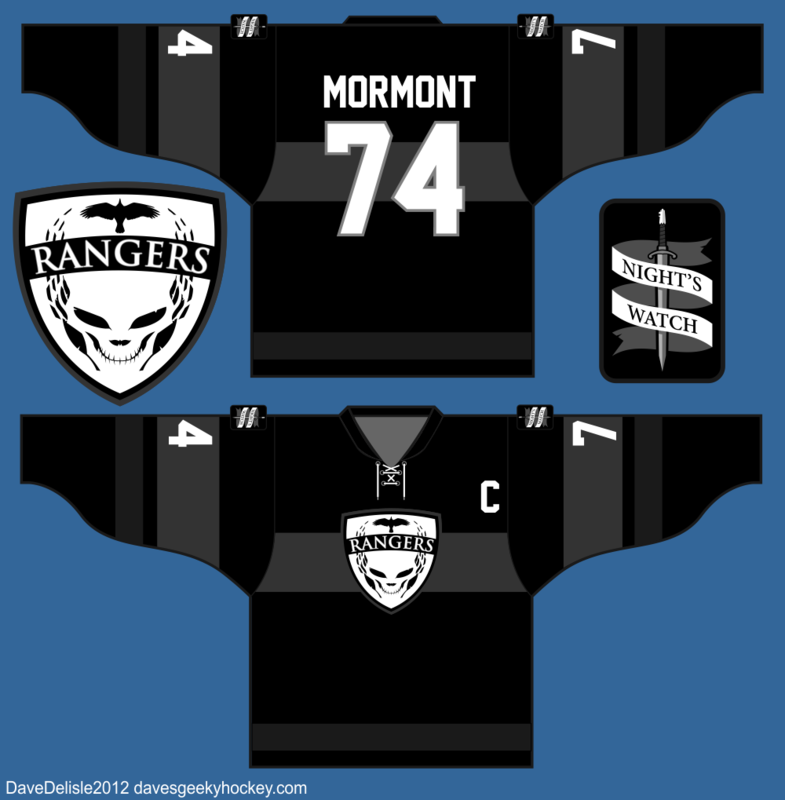 Went with Rangers as a team name, which felt better suited than having “Night’s Watch” plastered over the main logo. Also Rangers is a familiar team name. Night’s Watch was relegated to a shoulder patch that also features the sword Longclaw. The jersey had to be predominantly black, no way of getting around that. One design touch I made was making a light grey mid-stripe that also rides high on the arms. This stripe represents the Wall. What can I say? I’m a sucker for symbolism. This design will be made available soon! Sorry for the delay. Note: I forgot to change the number from a previous Hunger Games design, which is why it reads as 74. Should read 97 for the old bear. Posted on May 14, 2012, in Geeky Jerseys, Hockey Jersey Design and tagged Design, Game Of Thrones, Geeky Hockey Jerseys, Hockey Jersey Design, Logo design. Bookmark the permalink. 24 Comments. I dig the grey stripe and the crow but I’m not sure how I feel about “Rangers” what about the builders and the stewards? I think it would be better to have the crest say nights watch or even NW if there’s a copy right fear. Team names are better if they are plural and single-worded. Rangers represents a team perfectly. Night’s Watch or The Watch are simply not as good, but they are represented here. I would not purchase this based solely on the fact that it says Rangers on it (I absolutely hate the NY team!) but I am definitely in on the Direwolves jersey whenever it’s offered again! I think the feathers built onto the skull is overkill. It’s like “I have a crow! I found some feathers! Check this out!” just too much feathers. I’ve been excited for the Night’s Watch jersey, but I urge you to reconsider that part. It looks a bit like a predator skull made out of feathers. I just tried to Google “Feathers forming skull” and “feather skull” but no one has ever done something like this. It’s pretty bloody creative, despite what your childish quotes try to reduce it to. Of course you wouldn’t have a better idea if your life depended on it. Thanks for your constructive feedback on my comment, Mitch. I hope that you would agree everyone is entitled to their own opinion, and it’s nice that you took the time to share yours. Given that art is a subjective medium, what one person feels is a “better idea” will to another be worse, just as you like this design while I do not. I’m not saying it’s not “bloody creative”, I’m saying that it’s a feather overload and does not fit the team (in my opinion, as we’ve already established). The skull shape is ill-defined (which is why I related it to the predator skull) and seems distended. Something more understated would fit better, I believe – they’re not artisans who labour to produce art using remnants of wildlife. Not sure if this link other option will work, but that type of thing (a skull with crossed feathers beneath) would still enable inclusion of both motifs, just a bit more understated. A crow perched on a skull is overdone (see: Disney’s Snow White, for example), but there’s likely some other good ways to combine them if those are elements that they want to bring in. I do like the Crows as a team name (since that’s what the Wildlings call them), and so a Crow head in profile might also be an option to play with as well. What about something with a crossbow or regular bow? Given that they’re on the wall and watching for stuff, have that cleared are before the trees to shoot approaching wildlings (etc). probably falls into the traditional fantasy association with the word ‘Ranger’, but that may not be a bad thing. Where they’re also called “The Black Brothers”, maybe two black gauntlets holding hands at a 45 degree angle (picture the arm wrestling pose, but just the gauntlets)? I like the shoulder emblem, but can’t get past the feather skull. TOTALLY on board for this… Was looking forward to what the Night’s Watch design would look like, quite like this… plus I also happen to be a Rangers fan. Can’t say I’m a huge fan of the design, not what I expected. Was thinking more along the “Crows” name and a more simple crow design. The skull/features all seems a bit too small and detailed. But I’m not artist, just offering my opinion. PS – Is this the same “Devster” from CB? I appear to be in the minority, but I absolutely LOVE this jersey! This what I was hoping for…the talk of having other colors was ridiculous. The Black and grey work beautifully! As to the design, I think what you came up with is wonderful. You could tweak it all day and come up with more, but you have to just decide and go with it. I am completely torn on the Name. I think ‘RANGERS’ is fine. It works as an additional homage to the actual hockey team. Having said that, ‘CROWS’ works very well, too! Crows are used all the time in the books and have a lot of symbolism throughout the works. IF you go with CROWS, the skull should probably be reconsidered as it is more of the focal point of the design. What about a sword and a black cape instead, with the Crow flying up over it? All in all, I like the design and would buy one as is….But, there is always Night’s Watch 2.0 for an update! When are the next Lannister jerseys going to be offered? Great job, Dave !Keep up the great work! I going to keep this one simple like the design-Awesome! Love it! I love it, definitely getting one. Rangers is perfect, who the hell wants to play for the Stewards or the Builders? Everyone wants to be a RANGER. Skull design is excellent, both creative and evocative of the Nights Watch themselves. Kudos Dave on a fine design. I’d like to see the crow feature more prominently, maybe the crow image with “RANGERS” on top? I assume it would have to be sublimated but I think it looks pretty awesome; one time I saw a photo of one guy jumping into a goal hug and it looked like he was flying. Personally I love that design – something based around that premise would be awesome! i almost hate to throw in a comment since i’m happy with the direwolves jersey i just got but… what about just voiding all the complaints about feathers by using a stylized raven skull instead of a human one? i also think CROWS is slightly more encompassing of the wider watch than just RANGERS but i don’t care about whether it aligns with any existing NHL franchise, either. apologies if this comes across as negative – you and rinkgear have proven very capable of putting together a fantastic product and i’m sure the end result will be phenomenal. I’m with you on the Crow skull idea….but not the color. I think the colors are perfect. The name, I am neither here nor there on…I see both sides of that debate. When I travel, I often buy sports jerseys (rugby or hockey) from where I’ve been. Invariably, someone will come up to me and start talking about the team as if I have intimate knowledge of it. Of course, I have to admit I only bought the jersey as a souvenir. I only can imagine the conversations when one would wear a “Rangers” jersey like this…. 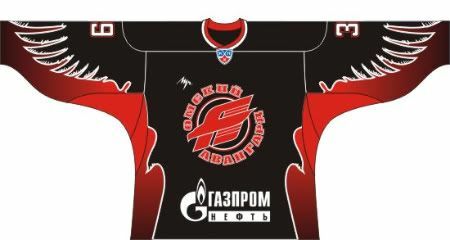 I would much rather this jersey be unique, with no possibility of it being confused as some 3rd jersey from the NHL team or some other crossover promotion from New York. I prefer the name “Crows” or perhaps something else…. Obsidian daggers (dragonglass) are seemingly the best weapon against the Others so maybe crossed daggers instead of a single sword? Crossed over a flaming torch? The other jerseys all had crossed swords, I believe. Rangers is too…indecipherable from real team name. How about Crows or Watchers? Watchmen?! Stewards? FYI just received my Direwolves 2.0 jersey, SO AWRSOME and it fits great!